What are Ship Cargo Holds? A ship cargo hold is an enclosed space within a ship designed for storing cargo such as coal, grain or salt. It usually lies under the deck of a ship and can hold anything from 20 tonnes to 200,000 tones. The purpose of a ship cargo hold is to protect cargo while it is transported to its destination. Access is usually gained by a large hatch at the top of the hold, and the cargo can be either loaded in crates or left unpacked. Several factors will determine how to best store, load and discharge the items in a ship cargo hold. These vary from the type of vessel, its cubic capacity and the appliances installed on board the ship and on shore. But ultimately, if you were to think of the cargo as income, the ship’s hold is one of the most important areas of the vessel and should be maintained to the highest of standards. A ship cargo hold’s cleaning operation will depend upon the properties of the previous material, the following material and the requirements of the shippers and receivers. After the cargo has been transferred from the hold, the space must be swept and cleaned thoroughly before being re-used. This involves removing any traces of residue, rust particles and cargo stains. A bobcat, bulldozer, wheel loader and/or shovels will typically be used to remove the cargo however, it is possible that several tonnes of material may still remain in each hold after the main bulk has been discharged. If this is the case, the crew is usually required to clear the remnants. Different cleaning regimes are required for different cargos, but generally the hold must be left free of all traces of transferable stains, previous residues, loose rust scale, paint flakes, paint blisters and any trace of infestation or strong odour. Vessels sometimes come equipped with fixed cargo hold washing machines but this isn’t very common. 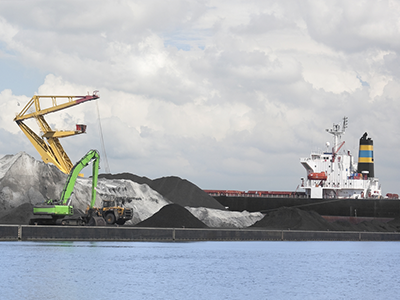 Most vessels carrying solid bulk cargoes will need to be manually washed which, dependant on time scale and equipment, can take up to a few days. After the majority of the material is removed, the crew might use high pressure seawater followed by fresh water to rid of any residue, before ensuring that the vessel is thoroughly dry. What common issues can affect Ship Cargo Holds? Contamination: Cargo contamination and infestation can occur if a hold is not sufficiently cleaned, leading to potential damage claims. If the previous cargo is incompatible with the next load, particular care needs to be taken as not to damage or destroy the product. Manganese ore, for example, would completely lose its worth if it were to encounter traces of chrome ore. Similarly, with sugar and cement. Material Buildup: Several tonnes of material can sometimes be left behind after cargo is cleared from the hold, subsequently causing buildup. When not dealt with correctly, this may hinder the process of pumping water away and make it easier for further excess materials to stick to the surfaces. Materials (especially foodstuff) which have been left in the bilges can also decay over time, giving away very unpleasant smells. Damage & Corrosion: It is possible for steel fixtures and rubber seals within the cargo holds to be corroded or damaged during cargo operations, possible resulting in separate damage claims. Other areas like the bulkhead can also be damaged if the vessel is not cleaned sufficiently. It’s important to ensure that any salt water used to clean the hatched is rinsed with fresh water to minimise corrosion and to prevent salt contamination of future cargoes. Debris: When the hold is free of cargo, routine air sampling procedures should take place in order to rid the pipes of any debris. This is done so that they remain clear for their intended purpose and debris cannot migrate into the hold. If cargo debris is trapped in any of the non return valves it will reduce the pumping efficiency of all the other hold bilges. How can a Ship Cargo Hold issue affect your business? Delayed departures: When a ship cargo hold is presented for loading and it’s not in the expected clean state for the intended cargo, delays, off-hire and charter party disputes can arise. Safety: Not only must the cargo be stored so that the ship is stable and seaworthy, it must also be secured so that the content cannot move if the vessel encounters extreme weather. How can Acoustic Cleaners prevent Ship Cargo Hold issues? The Acoustic Cleaners are lowered into the hold and progressively raised while sounding, thus providing effective cleaning for Bulkhead and Deckhead. Powerful Sonic Sound Waves produced by lowering the Acoustic Cleaner into the hold will make dry particulates de-bond from side walls for easier removal. These sonic sound waves are completely safe and will not damage any ship structure. A few seconds 'sounding' at periodic intervals is all that is required. What are the benefits of Acoustic Cleaning technology? There are several benefits to be had from using Acoustic Cleaners with the main one being that it is a preventative solution. As with all equipment, it’s always better to try to predict what problems could arise and snap them in the bud before they develop into costly, time consuming issues. Another benefit of Acoustic Cleaners is that they will not impact the surface of a cargo hold. They are designed to reflect sound, therefore the sound waves that they transmit will only penetrate specific areas. This will prevent structural damage and the propagation of wear.